Is there Nothing that I can do? I had/have a large cactus in a tub. I moved it off of the porch, so it would get more sun, and rain. It was looking good. Then during a storm the entire porch roof was torn and off, and placed right on top of my cactus. As soon as possible we got it off of it, and I removed all obvious damage that I could and started the pads in new pots. I placed it in the garden, for maximum sun, and more care. The next storm, yep you got it, a big branch, in fact, the entire top of the walnut tree fell, right on my cactus! Again, I took pads that were damaged off and put them in new pots, since the first ones had not survived. Well, this is what it looks like today. Notice the small pot on the left? That is the most recent baby rescued after the walnut limb hit it. But, the big cactus... I think it is dying. Is there something I should do, could do? Is there a more humane way to end this plants suffering? I don't grow cactus, so don't listen to me, if anyone else has any suggestions. But just from looking at your picture, I'd think just put it out of its misery! Looks pretty hopeless to the untrained eye! We have small native cacti here. Those look just like yours only much smaller. When I mow over one and sling little slices everywhere, each slice ends up making a baby cactus. 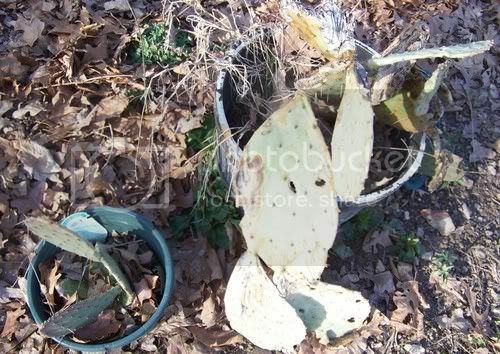 So I would say plant the cactus back in some sand or divide it and plant in several containers. I believe that each piece will eventually grow into a fresh plant. So, I am not the only one who thinks this plant has just had it. I do have two pots of it growing, the one to the left in the photo was a single pad, it has been there over a year, and is looking good. On the other side of the tub is another pad, it doesn't look so good, but has a new pad growing on it too. The first hit, I tried just placing pads on the ground here and there, and hoping they would root and grow without a pot. Those pads all came up missing, and the ones in pots just shrivelled and died. Does something eat cactus pads? I mean besides people, I do see these same cactus pads for sale at the grocery store. When I visited the east coast, I saw huge mounds of these cactus growing and in full bloom, awesome sight! So, when I was offered this big boy I gladly accepted. I have no clue how old it is. Who knows, maybe it is old and just dying of old age, and the accidents only made it more pronounced? Thanks for input, I will try going ahead and removing more pads and try to start them. But the color is so bad on the old boy, I honestly don't think those pads have the energy to grow, and I am glad that the baby is looking good. Each leaf should regrow if you leave it laying flat in a pot and keep the soil moist If not, you can bury the bottom section of the thop leaf and it'll regrow. It looks like you cacti was only a few years old at most, old patches are massive. Is that the picture of the cactus now? I have a patch of the native cactus and all the pads go limp and grayish in color during the winter, you'd swear they died. But I learned last spring that if you don't take advantage of this state and pull the weeds in the patch, they wake up turgid and spiny all over again, then you've lost the chance to weed. In fact, I have to get weeding them soon. Why are you growing them in pots? I heard that cactus grow long roots in search of water so they do better in the ground. Potted ones remain small? (I might be wrong) Is the one you have not hardy in your area? I don't know about the pads, but I noticed something -- probably rabbits -- have nibbled on most of the fruits during the winter. Since the fruits on these are rather small and seems to be more trouble than they're worth to prepare, I eat the spineless young pads and flowers. When I got this cactus, years ago it was in the large wooden bucket. So, I left it in it, and then with the damage to it and all, I didn't want to shock it more. When I was a kid my folks always grew these in large buckets. I tried to start some pads the first time it was hit, just on the soil, it disappeared, I still don't know where it went. In the pots, I can find them! See the leaves in the pots? They would cover anything and everything, then the poor pads would get raked up and thrown in the leaf bin... I wonder? Good news is 95% of leaves are now down, so if I rake now, maybe only once more and I am done for awhile! I potted up all the tiny cactuses in the house the other day, and man I got a lot of those tiny, can't see spines in me. I noticed, that once I played in the dirt, mixing it barehanded etc, they were gone. And to be honest, I have dreaded repotting the big boy, and changing his soil. He has looked sad in winter before, but, never to the extent of drooping down. And the babies are dark green! I think that I need to grab the log holders, since a tong won't work, and go try to lift him from his pot, either the roots are healthy or they aren't. Then just play surgeon and remove all damage. Live or die big boy, with fresh dirt, and back into his pot. I can't lift the tub he is in, if most of the weight is him, I could be in trouble here, but he has lost alot of pads and weight, maybe I can do it. If the roots are healthy, maybe I can just prune it and remove the damaged pads? Maybe? Oh well, if roots are done for, I have a nice big, wooden pot for planting the little pads in. When I first got the cactus division from my Dad, old vinyl shower curtain and nitrile kitchen gloves helped A LOT. You can also use folded newspaper to hold cactus. If it's the one in the picture, then I'd trim it down until the bottom leaf pads. That'll give it the best chance at life. The others can be planed elsewhere if you want. Most everywhere, cacti still haven't woke up yet from winter, especially not up in Arkansas. Only Southern Texas, Southern Florida and Southern California, and only at the bottoms, have warmed up enough for cacti to start perking up. We just started spring here in Texas, and we still hit the 40's the other night, and cacti here really don't wanna budge yet. Trimming it back to where the leafe can stand up on there own will be best. Then once it warms up, and stays warm, you can give it a good soak, and it'll be back to life in no time. Oh yeah, and don't water it much yet, or if there's any moisture in the pot, not until it warms up all the way. Right now theres still the risk of root rot.